Every facility with extremely hazardous chemicals, specifically ammonia, needs to perform a yearly Mechanical Integrity Inspection. This requirement is spelled out in IIAR Bulletin 109 Section 5.2, "Each owner should ensure an ammonia system safety check is conducted annually. ", and in Guidance for Implementation of the General Duty Clause Clean Air Act Section 112 (r) (1), "EPA believes that owners and operators who have these (extremely hazardous) substances must adhere, at a minimum, to recognized industry standards and practices (as well as any government regulation) in order to be in compliance with the general duty clause." Wagner-Meinert, LLC, offers an Annual Ammonia Inspection per IIAR Bulletin #109 as well as a more detailed Mechanical Integrity Inspection. The Mechanical Integrity Inspection performed by WMI goes beyond the basic inspections conducted in accordance with IIAR Bulletin109. During a Mechanical Integrity Inspection we conduct field tests on equipment and equipment safeties per our prepared checklist. Wagner-Meinert, LLC uses a checklist designed to incorporate the questions provided by IIAR and supplemented in those areas that were, in our opinion, lacking. 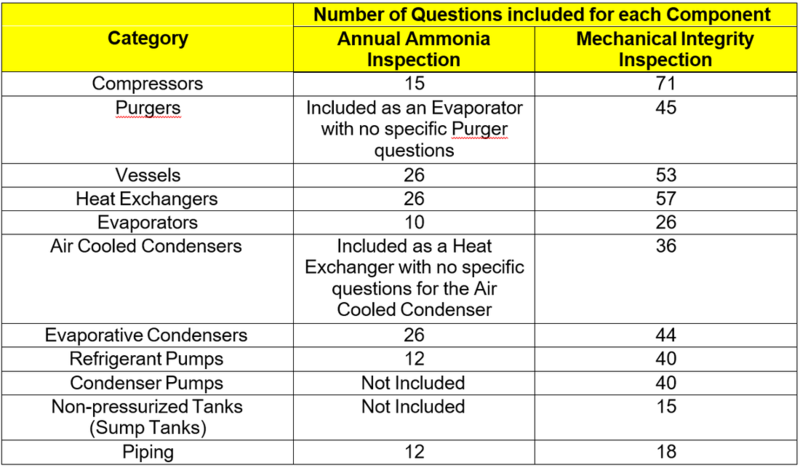 Below is a comparison of the Annual Ammonia Inspection and Mechanical Integrity inspection.